Avocado oil is an edible oil pressed from the fruit of the Avocado. As a food oil, it is used as an ingredient in other dishes, and as a cooking oil. It is also used for lubrication and in cosmetics, where it is valued for its supposed regenerative and moisturizing properties. It has an unusually high smoke point, both unrefined and especially when refined. The smoke point of the unrefined form is 480 °F and the refined form can reach 520 °F. The exact smoke point depends heavily on the quality of refinement and the way the oil has been handled up until reaching store shelves and subsequent kitchens. Avocado oil functions well as a carrier oil for other flavors. It is high in monounsaturated fats and vitamin E. Avocado oil also enhances the absorption of carotenoids and other nutrients. Because the avocado is a year-round crop, some olive oil processing facilities, particularly in Australia and New Zealand, process olive oil during the olive season, and avocado oil during the rest of the year. Avocado oil was originally, and still is, extracted for cosmetic use because of its very high skin penetration and rapid absorption. 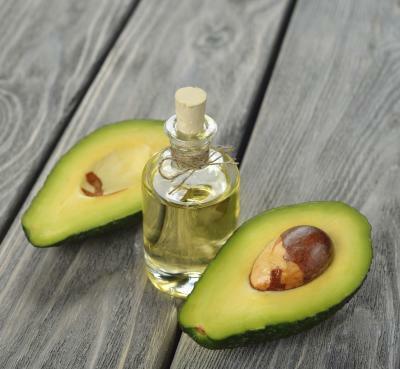 Following pre-drying of the avocado flesh to remove as much water as possible (˜65% water in avocado flesh), avocado oil for cosmetics is traditionally extracted with solvents at elevated temperatures. After extraction, the oil for application in skin care products is usually refined, bleached, and deodorized, resulting in an odorless yellow oil. Like extra virgin olive oil, cold-pressed avocado oil is unrefined and so retains the flavor and color characteristics of the fruit flesh. Recipes using Avocado Oil see Here and Here.